Beauty Pageant Gowns and Dresses are very important when entering Beauty Pageants! However, you should not stress out about it, remember you should pick a gown or dress that compliments your skin tone (by doing a color analysis), height and pageant hairstyle. 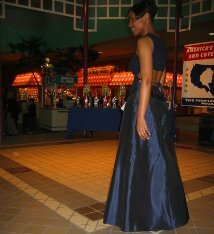 If you're on a limited budget like I was when I first started Local Beauty Pageants, you may think that you can't enter. However, I DISAGREE! You can definitely enter in any beauty pageant on a small budget to begin your Local Modeling journey! When I first started my Beauty Pageant journey as a contestant, some people didn't believe where I found some of my prettiest pageant gowns and dresses. Here are the unbelievable stores where you can purchase your cheap, but beautiful Beauty Pageant Gowns. * Please keep in mind this it was years ago when I bought my dresses that you see me in below. Therefore, you may not find dresses and gowns as cheap as what I paid. quality dresses for children, teens and women! See the link right below to check them out! Yes, Macy's has unbelievable Beauty Pageant Gowns and Dresses for girls, boys, teens and women for your Local Beauty Pageant needs. You can actually shop for your teens and women gowns in the junior section or in the women's section of the store. Both sections have great dresses. No matter what size you are, Macy's has Pageant Gowns for everyone. I actually bought this gown you see me in to the left from Macy's. They have a variety of different styles and colors. The best time to get gowns and dresses for very little money is in the fall. Why? Well, because they actually put the gowns and dresses from the spring and summer on clearance racks in the fall. They usually try to get rid of all the spring and summer gowns and dresses from high school prom's and summer weddings so they can get ready for the homecoming season. Macy's must clear their racks to make room for the homecoming gowns dresses in the fall. Which is also good for you, because even if you don't see a gown or dress you like on the clearance racks, you can always select from the new dresses and gowns they put out for homecoming. However, Macy's also puts out a nice spring and summer collection, so just keep your eyes open for their various clearance racks this spring and summer! I bought my dress on sale for about $45.00 and it was a $140.00 dress! Macy's has awesome deals. I really like Kmart's selection because you can get a nice quality Beauty Pageant Gown for a really in-expensive price. Kmart's selection includes really cute dresses for girls, nice attire for boys, and pretty gowns for teens and women as well. Also, most people would probably not shop at this store for their local beauty pageant dresses or gowns. This is good, because you'll less likely have on the same dress or gown as your competition. Also, K-mart allows you to put clothes in lay-a-way....which is even better! If it's on sale, just ask them if you can put it in lay-a-way for about a month until you come up with the rest of the money! I bought this gown you see above at Kmart and I got it on sale for about $60.00. Not only are you NOT spending a lot of money on your dress, but now you can take some time to pay for it! How cool is that!?! Very cool! *SORRY FASHION BUG HAS GONE OR IS GOING OUT OF BUSINESS! SO CHECK OUT THIS STORE INSTEAD! Last, but certainly not least Fashion Bug has proved to me time and time again that they definitely know what they're doing when it comes to Beauty Pageant Gowns. Whether they realize it or not, the gowns and dresses they carry, you can use for beauty pageants! I've shopped at Fashion Bug for years and when I noticed that they started carrying dresses and gowns I was blown away! 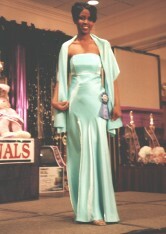 I bought this Pageant Gown you see me in above for about $30 during one of Fashion Bug's clearances. Also, guess what? I ended up doing some Local Modeling for Fashion Bug as well! Don't let Fashion Bug fool you! They are definitely in the running when it comes to your Beauty Pageant Gowns and Dresses for girls, teens and women. If I had to choose my favorite off-line retail store for pageant dresses and gowns, I would choose Macy's! Not only do they have very nice quality clothes at very cheap prices, but they have the most variety than the other two stores. However, I would shop at any one of these stores time and time again for my beauty pageant gowns! Since this was years ago when I bought these dresses above and the prices just aren't what they used to be, I now shop online! Amazon has the best of everything you need for Pageants, including Dresses and Gowns, Shoes, Dance Attire, Interview Suits, Hair Accessories, Swimsuits, Makeup, Jewelry and so much more!